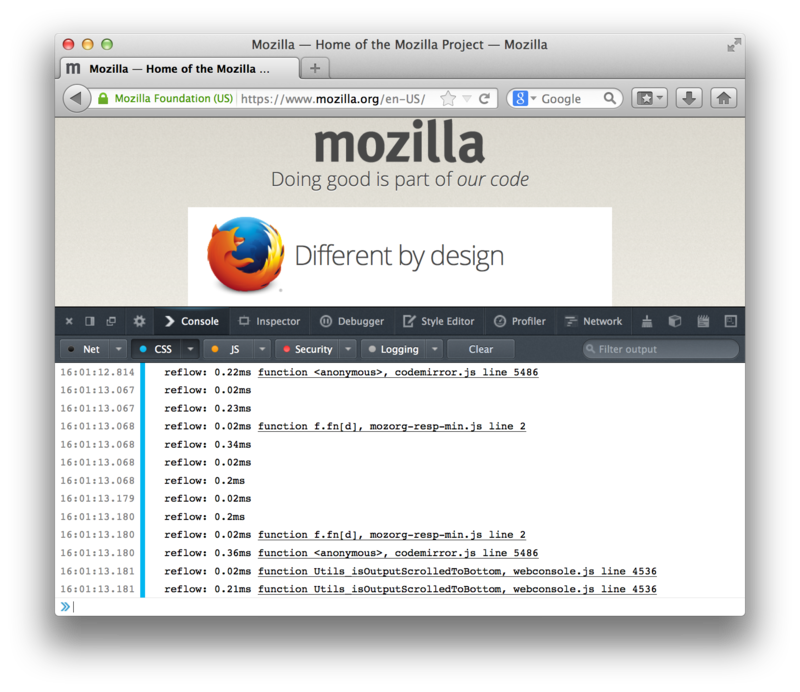 Firefox 27 was just uplifted to the Aurora release channel which means we are back to report on new features in Firefox Developer Tools. Below are just some of the new features, you can also take a look at all bugs resolved in DevTools for this release). You can now automatically break on a variety of DOM events, without needing to manually set a breakpoint. To do this, click on the “Expand Panes” button on the top right of the debugger panel (right next to the search box). Then flip over to the events tab. Click on an event name to automatically pause the next time it happens. This will only show events that currently have listeners bound from your code. If you click on one of the headings, like “Mouse” or “Keyboard”, then all of the relevant events will be selected. Now in the inspector, you can right click on an element and open up an editor that allows you to set the outerHTML on an element. 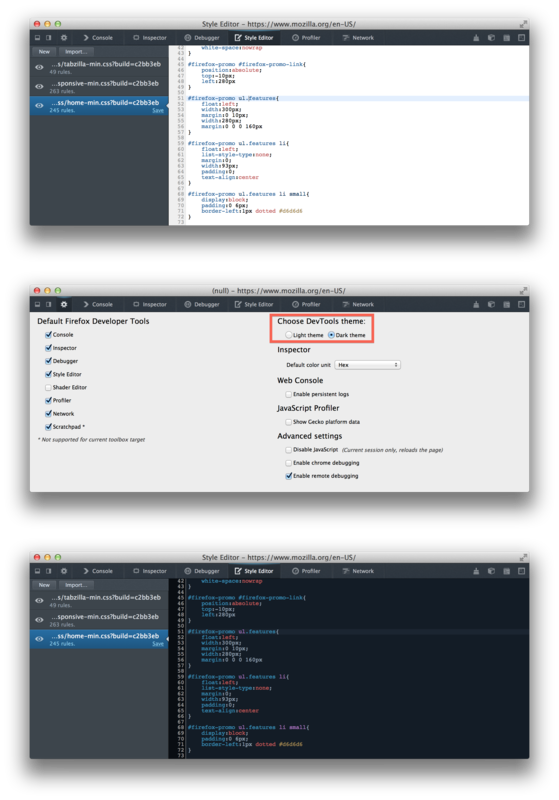 In addition to above improvements, Mutated DOM elements are now highlighted in the Inspector. Keep an eye out for more tooltips coming soon, and feel free to chime in if you have any others you’d like to see! Codemirror is a popular HTML5-based code editor component used on web sites. It is customizable and theme-able. The Firefox Devtools now use CodeMirror in various places: Style editor, Debugger, Inspector (Edit as HTML) and Scratchpad. From the Option panel, the user can select which theme to use (dark or light). When the layout is invalidated (CSS or DOM changes), gecko needs to re-compute the position of some nodes. This computation doesn’t happen immediatly. It’s triggered for various reasons. For example, if you do “node.clientTop”, gecko needs to do this computation. This computation is called a “reflow”. Reflows are expensive. Avoiding reflows is important for responsiveness. To enable reflow logging, check the “Log” option under the “CSS” menu in the Console tab. Now, everytime a reflow happens, a log will be printed with the name of the JS function that triggered this reflow (if caused by JS). That’s all for this time. Hope you like the new improvements! There is a bug opened for the F2 keybinding, it should be landing soon. You can follow it here if you’d like: https://bugzilla.mozilla.org/show_bug.cgi?id=892275. Nice I hope there will be some support for SASS/LESS too in the future :) Now it’s only in firebug but it make’s it very slow to work with. This is being worked on right now: https://bugzilla.mozilla.org/show_bug.cgi?id=926014. Original sources will be shown for any style sheets with a source map. Pre-release Sass supports source maps, but I don’t think LESS does right now, to the best of my knowledge. Thanks for taking the time to put in your vote. We’re actively working on that. We’re planning on implementing a new highliter in the next release or so. Here is the bug, if you’d like to follow along: https://bugzilla.mozilla.org/show_bug.cgi?id=663778. I’ve ditched firebug for the built in developer since these cover 99% of what I want to do way faster than firebug can. 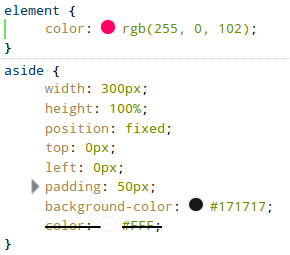 However, I’d love to support for pseudo elements appearing in the inspector’s CSS pane. This is the biggest lack I’ve noticed since switching exclusively to developer tools from firebug. Great work on this release! I’m looking forward to where this is going. Unfortunately, hover func. is almost useless as it is not preserved after the next click in the dom tree. The reflow logging looks awesome, can’t wait to check it out! Optionally having a Command Line at the bottom of the Debugger window (like Firebug) is essential when debugging js code. Thanks for the feedback – we’ve gotten this suggestion from other developers as well and are working on plans to implement JS input in the debugger over the next few months. At least you can add any expression in the watches window and see what it is, while debugging. Great features! Reflow logging is invaluable for optimizing scrolling (that is until Chrome Timeline-like feature is available). Unfortunately the menu option Log is not available on CSS tab in Console pane in my Firefox Nightly 27.0a1 (2013-10-24) on Ubuntu 13.04. What OS are you on? I don’t see anything particularly bad, running on OS X 10.9 with Aurora 27. All I did was open up google.com with the debugger open. Edit as HTML, background-image preview and color preview + HEX format! It does not repro on Aurora, which at this moment is still at version 26 on my Ubuntu. It does repro in Nightly (at version 27), but only after you click on the Debugger tab. Note that initially dev tools open on the Inspector tab, and this is one possibility why it did not repro for you. Hope this helps nail this sucker. I am on 13.10 and do not see any big difference. Are you using the Ubuntu-provided nightlies (firefox-trunk) or the Mozilla-provided ones? Keep in mind that opening the debugger will always have some small perf impact as it will put the page in debug mode, which discards some JIT optimizations. I understand that JIT is disabled, but I am not running anything. I understand that some timers could be firing on the page, or even a requestAnimationFrame, but Chrome dev tools barely registers in top. But when I open google.com in FF top shows CPU at 20% on 2-core machine and at 80% on github.com page. When I switch back to google.com CPU goes to 40%, when I come back to github.com – CPU remains at 40%. Bizarre. Hope this helps. We can switch this conversation to email and I can provide more info to help you pin it down. I am *this* close to switching back to Firefox. These changes are amazing, and the speed at which you’re improving the dev tools is out of this world! Are there any plans for WebSocket debugging, specifically listing the sent and received frames? That’s the last thing I’m missing to make the switch. This is… beautiful. 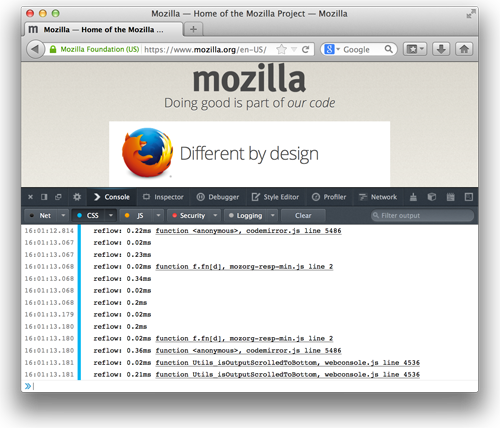 No separate Chrome-instead-of-a-browser for debugging anymore. Awesome. Most of the times I mention the Firefox Developers Tools Inspector, people are telling me that Firebug has the ability to edit HTML inline by just typing on the source view. Now that Firefox has something similar (and even better, as it highlights the element node source) it is better than nothing, but I suggest still implementing inline source editing, for people who are more familiar with Firebug. In the last FF update (25) the inspector features autocompletion for css values, is great, but in Firebug if you press arrow keys you will see all the options. Any plans for this in FF? We’re hope to make all values accessible via autocomplete, which sounds like it would address this issue. Hi I have a small problem, I have a code that after 1s automatically sets the marginTop property for some box, and this box always stay in the same position (when scroll page). 1. How disable blink element in Inspector? It’s too distracting. Now I see my Rules panel (right side) blink too (looks like strobe effect), other tabs not blink (Computed, Fonts, Box Model). Everyone knows that blink efect is bad:) Why not make a less invasive signal? In Firebug we have just different background (yellow) for modified stuff (and Style panel not blink). Please add option for off blink and all will be happy (current background color is good). 2. In this case I have a problem to select :hover, :active, :focus and all other options. When I click small down arrow I see all option, but after 1s this menu disappears (I guess it’s my fault code). When I use clasic context menu browser its always visible, but not context menu in Web Tools, even if I select element which do not change or click right mouse inside Inspector. This behavior is very inconvenient, and practically impossible to use this menu. 1. Color swatch previews – nice, but in my opinion this circle is too small, says little about color. It will be better if you add hover for rules and display slightly higher rectangle (as in Firebug). 2. Image previews for background image and image (in HTML and CSS) is nice, but for me it’s too slow, thumbnails should pop up faster, it can be somehow faster? 3. You can add pop up for font rules too (as in Firebug). 4. How dissable border dashed in CSS rules (when hover rule)? When we have more rules this effect reduces readability. 5. How set in Rules panel, that when we hover some single rule, checkbox (on/off) appears only for this rule, but not for all? Now this behaviour and previous (border dashed) reduces readability in this panel. Thanks for your attention and look forward to a reply. Nice to see that the built-in tools are constantly improving. Hi, the Break on DOM Events feature is great, but it could be interesting to have the target element opened in the inspector when clicked. Same in the Console and its properties panel: when we have a DOMNode as a value, changing it in a text field doesn’t make much sense. Why not open in in the inspector instead? Remote/browser debugging add-ons does not always work. On desktop scripts in chrome://myapp/preferences.html stop on breakpoints only on the first load of the debugging session. Afterwards it just ignores any breakpoints. On fennec the code running on tabInit stops on breakpoints only if you disable/reenable the add-on. Opening a new tab is not enough. DocLoad is fine though. On fennec chrome://myapp/preferences.html is undebuggable. Opening the tab process shows no sources. Breakpoints in the main process are ignored. Sorry we didn’t reply to you previously. I agree that there is more work that needs to be done to help add-on developers debug their add-on code. For example, currently it’s not possible to debug the actual startup() in bootstrap.js. The presenter acknowledges it briefly so I’ll have my hopes up. I’ll open up some bugs once I find the time to build a minimal case add-on. Will there be a Clear button on the Network tab in this release? Out of curiosity, what were the reasons the Dev Tools team went for CodeMirror over Ace? Will we see a Clear button on the Network tab? What about using the console.log functionality? Will console.log(“test”) now have a more sane output? Will console.log($(“myElement”)) highlight the actual element in the DOM? I cannot get the Aurora download to complete the install, so until that happens even trying out the cool dev tools seems to be out of reach! If the problem persists, please ask for Firefox support. I tried it again sometime later and the install finally worked! Playing around with Aurora now! Thanks!